One month ago today I gave birth to our beautiful son. I know everyone says this but I cannot believe it has been a whole month. Days feel quick and long at the same time. He is changing quickly and it is bittersweet. More to come on our first month.. It is a very interesting process to prepare for labor. You make a plan but you are told to hold is loosely because really, "who knows" how it'll go. So I planned and prepared the best I could (and tried to be open in the process). I was so hungry my whole pregnancy but I tried to nourish us the best I could. I did prenatal yoga to ease the discomfort and prepare for labor. I hired a doula to help and support both Charles and I in this process (also because I was unsatisfied with most of my prenatal care and wanted someone I was connected to in the process). We researched things about the birth process and our babies arrival, stressed, prayed and waiting with anticipation and excitement. I had my 40 week appointment on Wednesday February 21st. Nothing was happening and I was really hoping our little one would progress naturally before we had to talk induction. We made a plan for the next week with our doctor and she sent us on our way. As we went to leave it all began. I stood up to leave my appointment and my water began to break. It wasn't like an all out flood but a definite leak that I couldn't control. We asked our doctor to come back in and in a moment she confirmed what was happening and sent us on our way to the hospital. This was quite shocking since I wasn't experiencing anything in regards to labor. We had our pup in the car and we're headed to walk a local trail. Not anymore..
We went home and prepped for the hospital which was quite surreal. Charles did some cleaning and last minute dishes, we ate lunch, packed our final bags, prepped for our dog sitter and made some calls. It felt very logistical at this point. I really hoped to labor at home but my water breaking put our babe at risk of infection eventually. 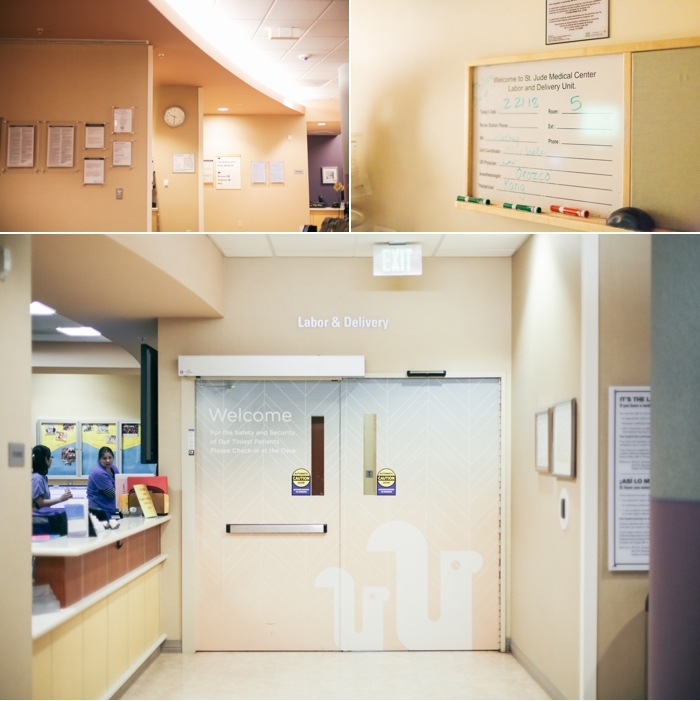 We arrived at the hospital at 1pm. This still felt very surreal since nothing was really happening. However once we got into our room and I changed into the hospital gown tears began to flow as I hugged Charles. This was happening. We we're going to welcome our child into the world soon (ish). After 9 months of growing, waiting, anticipating.. this was happening! They hooked me up to the monitors and I was having contractions every 2-4 minutes but nothing I was really feeling. They began to talk about starting pitocin. I was really hoping to wait and allow things to happen naturally. I asked to first take a hot shower and once I began this process contractions started to kick in. My doula Rachel arrived to support us and by 6pm I was feeling some intensity. By 7pm there was definite pain and I could tell this was going to be quite the process. However I wasn't dilating so conversations about pitocin continued. By 7:45pm we started the lowest level of pitocin. I was already in quite the amount of pain and the intensity of contractions increased (and the recovery time between them decreased). Y'all, this was not fun. Basically from this point on it was all hands on deck. Things progressed faster than anticipated and Charles and Rachel were there to help me cope with each contraction. The nurse was having trouble monitoring our baby's heart beat when I was on the yoga ball so I had to move to the bed for the rest of labor. This didn't allow as much pain relief and ability to cope. It all feels like a bit if a blur from here. I spent most of the next few hours with my eyes mostly closed giving physical clues to Charles about what I needed (pressure on my back, water, rest). Around 10pm they turned off the Pitocin. My rest times were so short. 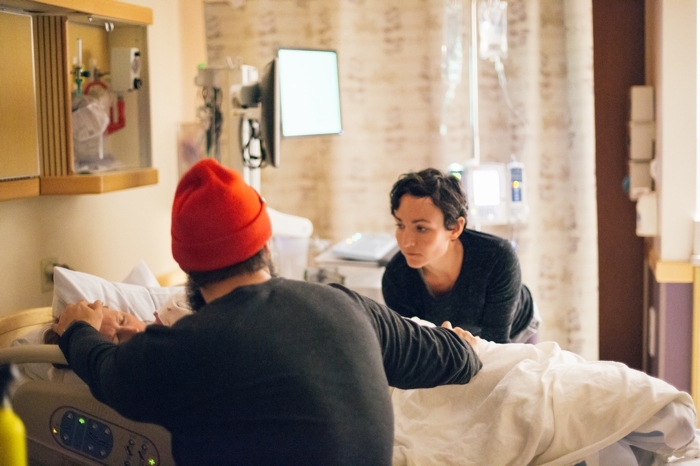 I had such little time to recover between contractions so they had Charles placing oxygen on my in my rest periods so we both could recover between. Each contraction cycle was: immense pain and trying my best to cope (this was an intense and loud process), oxygen during the break, a sip of water, repeat. As determined as I was for an intervention free labor I was feeling pretty defeated by how painful this was. But I just kept taking it one contraction at a time. Rachel would remind me I was headed to rest each time and I could do it. Charles was my biggest support (cue the tears as I type) cheering me on with encouragement, dedicated support and focus. I remember looking at the clock sporadically and hoping our baby would be born before midnight (just hoping the end was in sight). By 11:30pm Rachel and Charles suggested they check my progress due to the ongoing pain and intensity. Our nurse said that once I felt pressure in my bowels they would. I was so happy to utter out "Oh, I am. Things are feeling different!". So they checked and our nurse declared I was ready. These words were such a relief to hear. Thus began the coaching of pushing. This was a reprieve from the pain of the contraction but also so much work. With each round of pushing I hoped our baby would arrive. The doctor came in and it felt to real that this was happening. However Rainier wasn't quite ready to exit and she needed to head to a C-section. They told me to slow down my pushing to every other contraction. This was not good to hear. It allowed a little recovery but also meant I had to sit in the pain more. However if you've been here you probably know once the need to push comes, you can't really stop it. My doula encouraged me to let my body do what it needed to do (again, relief) and so I did. I am so thankful for our nurse who encouraged my effort to push. 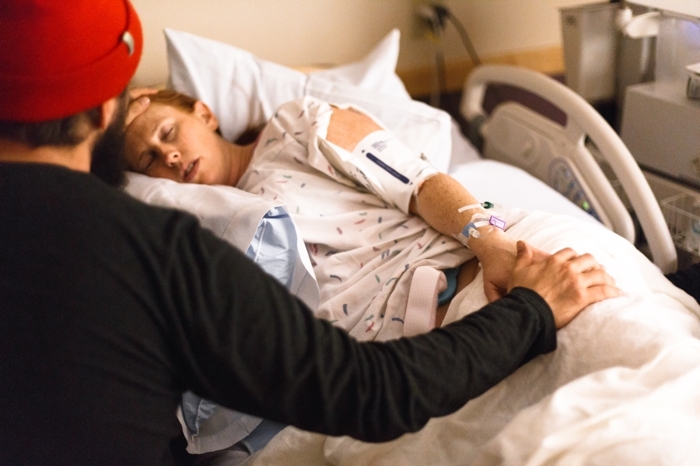 I could hear her saying that we needed to get the doctor back and we were going to welcome our child before she did the C-section. Ahh, sweet relief. Yes, please, let's do this! I opened my eyes to see the doctor and the set up for delivery taking place. Again, cue the tears as I type. 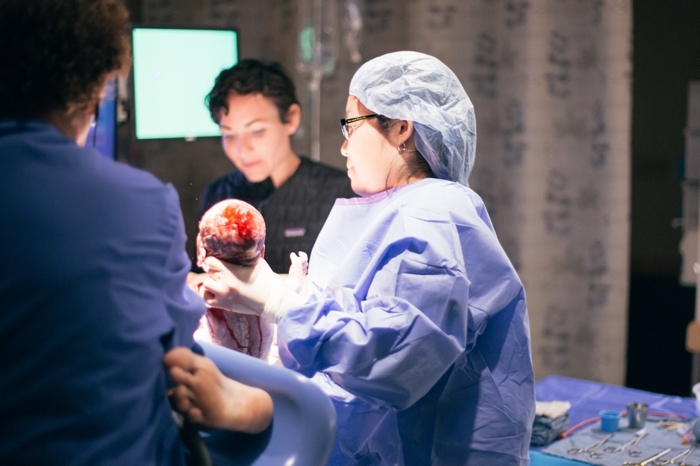 Our baby was making progress towards birth and hearing them exclaim that they could see the head was THE BEST NEWS. This was just the encouragement I needed. I really hoped it would be one push and done. It wasn't. But Charles cheered me on with each push and he watched our baby's head come closer and closer. This was happening! I can't really say how long it was from this point but they coached me and cheered me on and then our baby's head was out. I can't even express the joy in these words. Another push and out came his body. This was the most beautiful feeling. OUR BABY WAS NOW IN OUR WORLD. February 22nd, 2018 - 1:13am we became a family of three. Since we didn't know the gender we wanted Charles to see and announce the news. I am not sure I've heard such a joyful celebration before (and he's pretty joyful). 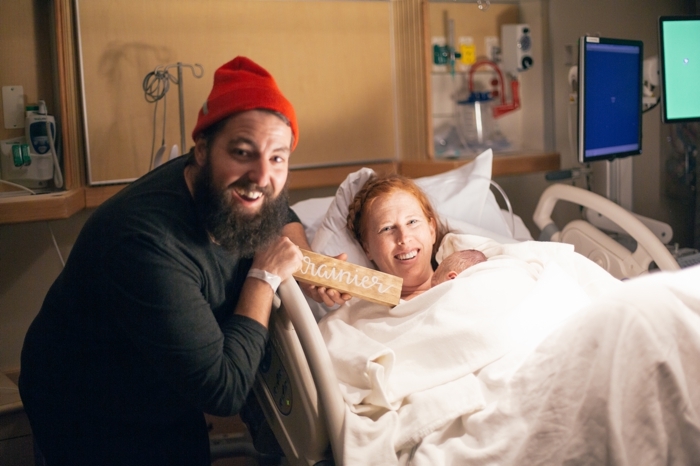 He declared multiple times with such enthusiasm, "IT'S A BOY... IT'S A BOY!!!" as tears flowed from his eyes. I couldn't even cry but I was so overwhelmed as they placed out baby boy on on my chest. He was here. I am pretty sure that is all I repeated for a few minutes. "You're here. I love you. You're here!". There was plenty that still had to happen as the doctor finished up the process but nothing else mattered. Our baby was in our arms. I was overjoyed. He is beautiful and in my arms. The team cleared his passage ways and made sure he was healthy. I was so looking forward to this time - The "baby moon" as they call it. The first hour+ of skin to skin connection, breast feeding and quiet time taking in our new little one. Looking into my husband's eyes as we soaked up our baby's presence was the most beautiful time. I'll be honest. It was tough. I was immediately so thankful it was over. I joked with Charles about Rainier being an only child because I didn't want to do it again. They say it gets easier (I sure hope so). But I was so relieved, thankful, exhausted and filled with love and joy for this little gift. I loved having a doula. This support and relationship was so valuable as we prepared and delivered. I am also so thankful we had Taylor photograph our birth. If you can, I highly recommend hiring a birth photographer. I was nervous for her (this wasn't going to be pretty) but she was so excited and supportive and I am so thankful she was there. She did the best job capturing the most significant moment in our lives together and the ability to relive our experience after was so beautiful. As Charles and I viewed our photos I had so many questions about moments I couldn't remember or didn't realize. I cried my way through each moment relived. 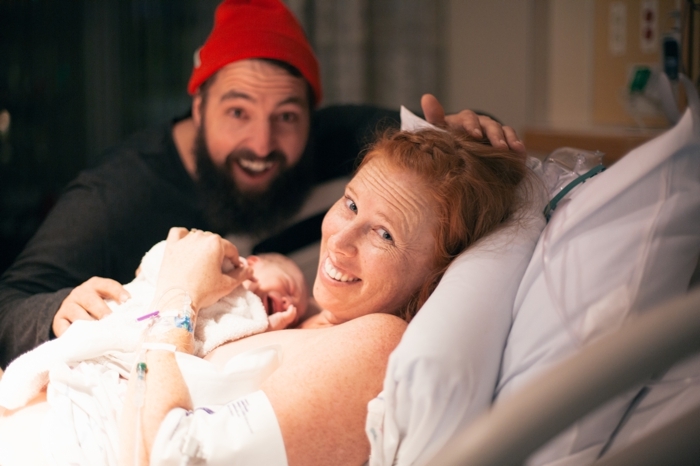 Here are the images from our sweet babe's birth.. (warning: one has some blood). Brief moment of calm. Very brief.. I am so thankful for my teammate. When stuff got real. Sitting up, learning to push. I remember looking at the clock wanting it all to finish quickly. THERE HE IS. What a beautiful sight. Finally. So much emotion and gratitude. I love my husbands expressions. So much excitement and love. Watching over the new babe..
Quiet moments holding my son close. Such relief and love. What does one do while they wait for baby to make it's way in the world? 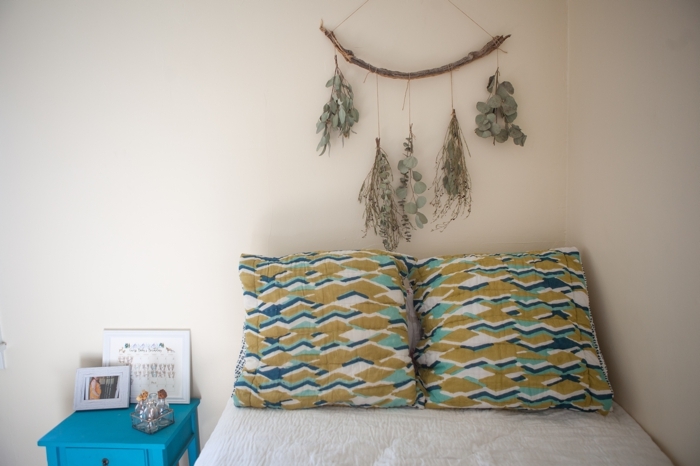 I suppose it's time to document the little space we've created! It is still surreal to think we'll be bringing our little one home to join us in our world. I guess it will feel that way until we do (or maybe even longer). Honestly this waiting phase is interesting. It is special but it is also a little stressful. But I am embracing the waiting, soaking up the much needed rest and praying for this process ahead of us. 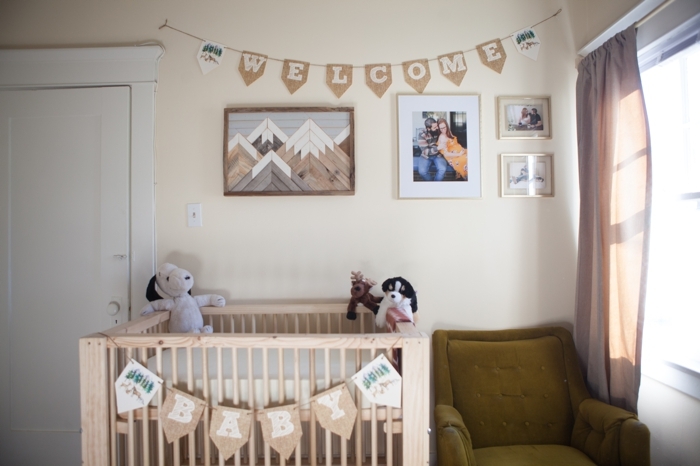 We don't know our baby's gender and it is funny how people ask, "Wow, how will you decorate?" 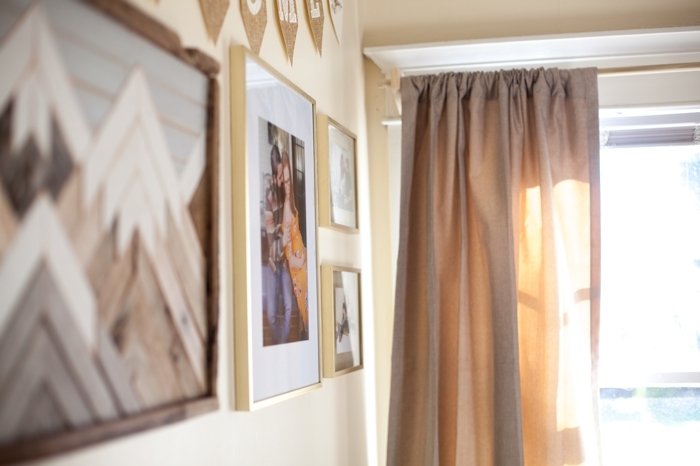 What we really need is a functional space to bring our child into. Honestly, this could look a lot of different ways and it doesn't have to be ready by the time he/she arrives. We don't desire a super "gender specific" space so that isn't a concern. We're more into the rustic look with wood furniture and accent pieces. The teal table, giant pillows and green chair were already in our space. 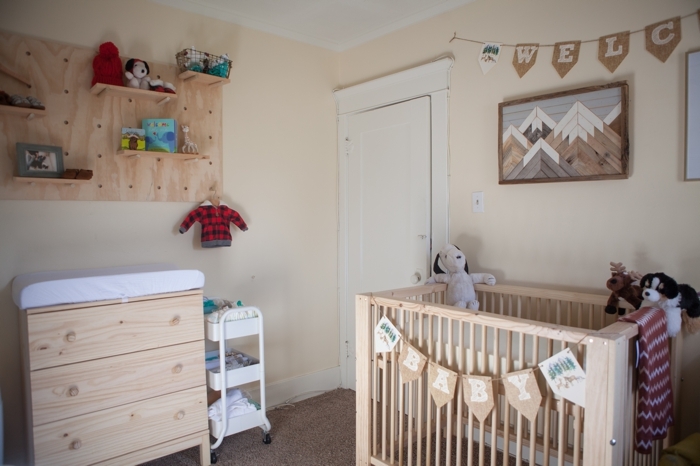 Then we just added the needed furniture, some baby items and some art and VOILA - our baby space. I love some of the well themed spaces I have seen but I guess that just aint us. Also, I am sure it will evolve over time and once we know their gender. So, here's a little look into our space (and the process of it unfolding). We decided to keep our guest bed in the room for guest we may have while our babe is still sleeping in our room and long nights with babe to not wake each other. 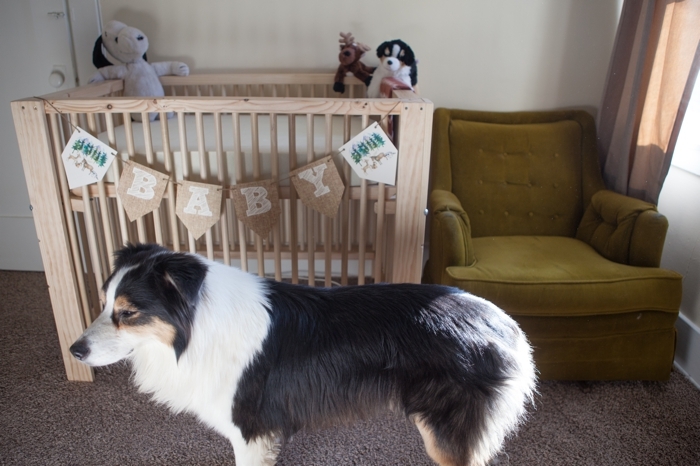 This led us to a mini crib (have you seen how BIG cribs are?). From day one Charles wanted to build our crib. I of course thought it would just be easier to buy one (and honestly cheaper) but I am so grateful for his desire and labor. I love it and it will be so special. Didn't he do a great job? The mountain art was a custom order from Raw Restorations and was Charles' Christmas gift from me. 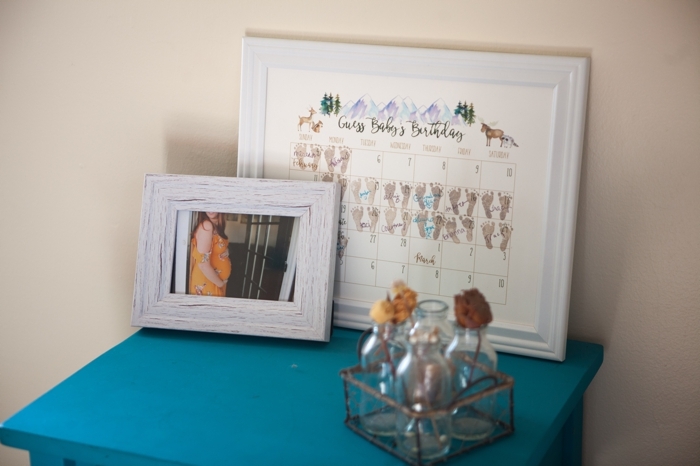 Of course, photos on display from our maternity session thanks to Tay Joy Photography. When we hang in here Winston likes to lay in front of the crib. I think he's ready for his new role. 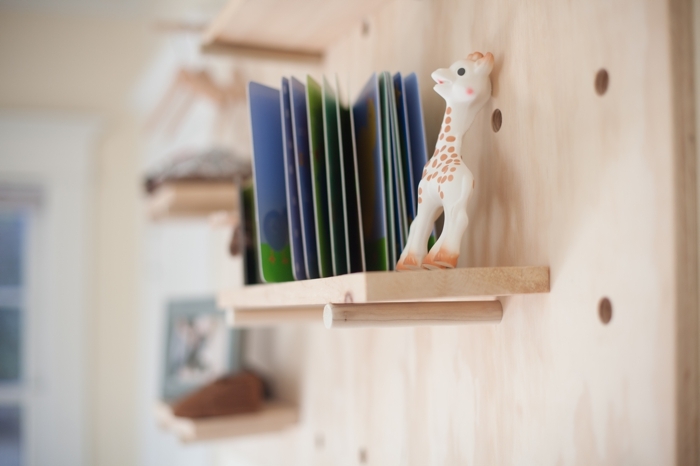 Charles also build this super custom wall shelf. 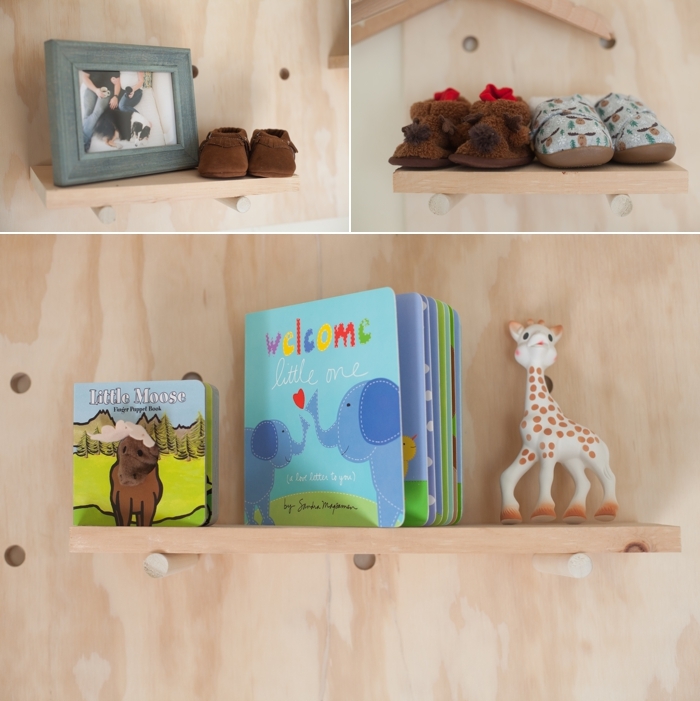 It has moveable pegs and shelves so we can use it and decorate it uniquely over time. The small dresser is an Ikea purchase that doubles as a changing table. Little baby things are the cutest. At my shower friends guessed baby's birthday. There's still a few in the running.. This room gets the best afternoon light.